Something up with my banter, chaps? A friend recently emailed the following photo to me and asked if I knew what type of aeroplane it is. He said nothing other than that. For some reason I thought that I recognised the background as my home town and so did a little digging on Google. 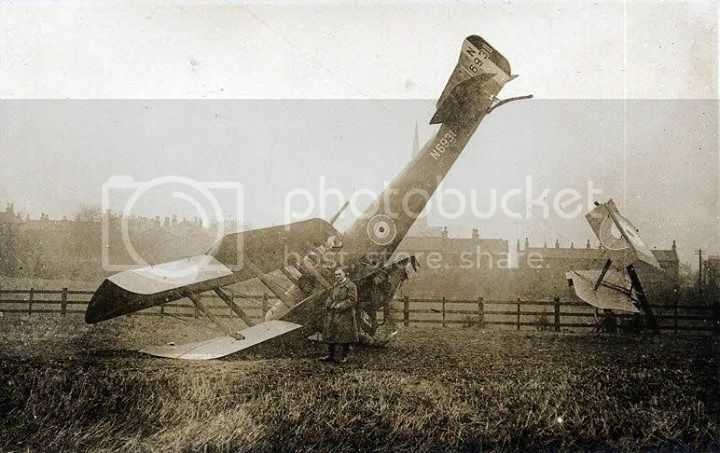 I discovered that the photo is of a Sopwith Cuckoo that crashed in Ossett in the West Riding of Yorkshire whilst en route from Doncaster to Newcastle on Tyne on the 19th of November 1918. The pilot, Flt. Lt. H.L. Taylor, (presumably that's him in the photo) was unhurt, save for cuts and bruises. He had become lost in thick fog and had missed the spire of Holy Trinity Church (seen in the background) by one metre as he descended! It appears that he was attempting to land in a field when the wing struck a telegraph pole. Just a few months earlier, in April 1918, Taylor had been shot down over Bois de Gentelles whilst flying an R.E.8. His assailant was Lieutenant Walter Göttsche of Jasta 19,who was flying a Fokker Dr.1. Taylor's observer, Lieutenant W.I.E. Lane returned fire and shot down the Fokker, which crashed killing the pilot. Taylor and Lane made a hard landing but were still added to Göttsche's final score of 20 victories.